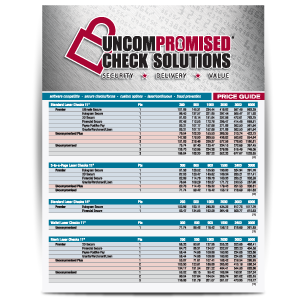 A complete resource about Uncompromised Check Solutions. 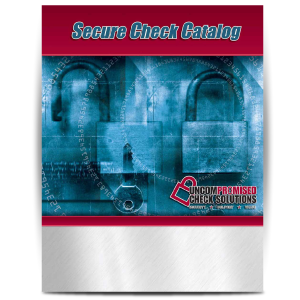 The catalog defines each check level and provides detailed information regarding security features, color options and available formats. 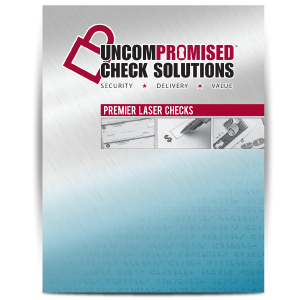 The Uncompromised Premier level includes six layers of check security options: Granite/Parchment/Linen, Payee Positive Pay, Financial Secure, 3D Secure, Hologram Secure and our most secure, Ultimate Secure. This catalog gives you details of the different types along with their security features. See the different ways to take your business checks on-the-go in this catalog: binder, book or pocket packages are available. 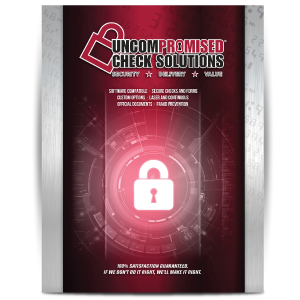 From small business to large corporation, Uncompromised Checks meet the needs of every customer and ensures solutions for all check requirements. The Custom and Long Run Check Catalog focuses on the products outside the software compatible lines. 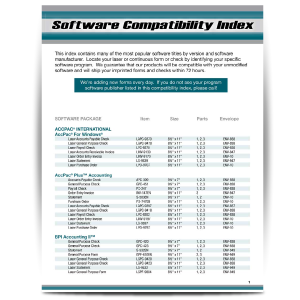 The printed Compatibility Index makes choosing the right product for your customers' accounting software a breeze.